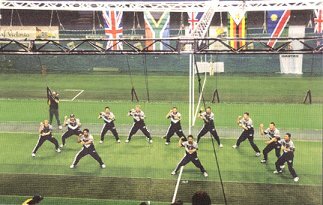 New Zealand have been a regular international competitor in indoor cricket ever since such competitions began. This is their third appearance in the World Cup. Congratulations to the New Zealand fans - theirs are currently the most visited World Cup Nations pages at Indoor Cricket World. New Zealand Player Profiles (including photos) here - and don't forget, the first of our "Postcards From South Africa" gives an in-depth, highly scientific analysis of each team's chances from the pen of the most respected commentator on Indoor Cricket alive ... well, okay, so he's the only commentator at the moment, but let's not split hairs. The following is the New Zealand Men's World Cup squad. This list should be considered as provisional at this stage. Thanks to Paul Botterill and Amanda Broad for providing this information, and Amanda for providing her excellent photos of the 1998 World Cup. We'll soon have more of Amanda's work on display.